Looking for a Used XL-7 in your area? CarGurus has 171 nationwide XL-7 listings starting at $1,950. 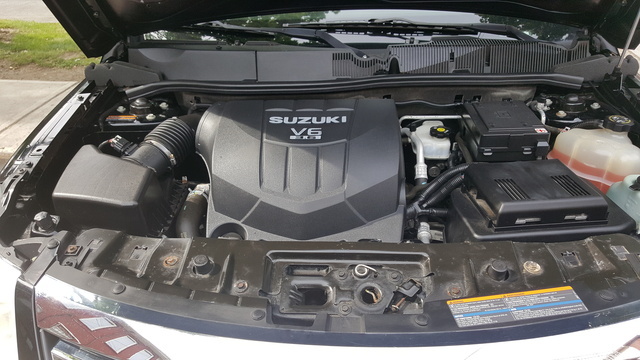 A terrific powerplant literally puts the 2009 Suzuki XL-7 ahead of the class in terms of acceleration, and families will appreciate its roomy cabin, five-star safety record, and affordable pricetag. Poor visibility out the back and excessive road and engine noise detract from the 2009 XL-7, which also lacks style and uses materials that make the cabin feel cheap and out of date. Although it offers good cargo utility, three rows of seats, and a tough engine, the '09 XL-7 does not stand out in a field crowded with more fuel-efficient, nicer-looking, and better-handling SUVs. The XL-7 seems best targeted for families on a tight budget who need the space and versatility of an SUV combined with a low pricetag and long-term warranty. Suzuki's largest crossover, the 2009 XL-7 offers the capacity and roominess of a midsize SUV for the same price found in most compact wagons. Longer than its closest competitors (Highlander, Pilot, and Tribeca), the XL-7 seats up to seven people in three rows. The two-row, five-seat trims have been dropped this year, along with the Base. Available trims include Premium, Luxury, and Limited, all powered by the same V6 engine. Other changes for 2009 include a new six-speed automatic transmission and standard self-leveling suspension on all trims, which automatically adjusts the suspension according to road conditions and cargo loads to achieve optimal stability and balance. 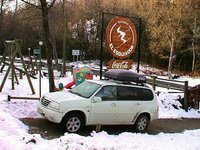 This front-wheel drive-crossover is available with all-wheel drive, which adds extra traction on slippery surfaces, but should not be used in off-road situations. The '09 XL-7 drives more like a car than an SUV, and its interior space and storage compartments are geared toward family utility. Its five-star safety ratings should also appeal to parents, and for families on a budget, the XL-7 is both inexpensive and comes with a 7-year/100,000-mile powertrain warranty. On the outside, the wagon attempts a sporty and aggressive look created by flared wheel wells, a steeply raked windshield, dual exhaust tips, and diamond-shaped headlamps. 16-inch alloys come standard on the Premium and Luxury trims, while the flashier-looking Limited adds 17-inch alloys, more chrome exterior trim, and a rear spoiler. Despite its low price, strong safety profile, and powerful engine, the XL-7 remains one of the worst-selling SUVs on the market, finding it hard to compete with better-established and more refined offerings from Honda and Toyota. Under the hood of the 2009 XL-7 you'll find a 24-valve, 3.6-liter DOHC V6 engine, delivering a plenty powerful 252 hp and a sporty 243 lb-ft of torque at a low 2,300 RPM. A five-speed shiftable automatic comes standard, and this year the XL-7 adds an optional six-speed automatic with manual mode. This new transmission supposedly increases fuel economy by 10 percent in front-wheel-drive models and by 5 percent in all-wheel drives. Variable valve timing on both the intake and exhaust camshafts also improves fuel economy, but even with all these enhancements, the wagon still averages only 17/24 mpg in front-wheel drive and 16/23 in all-wheel drive. But who needs fuel efficiency when you have so much power packed into the V6 engine? With 0-60 times under 8 seconds and quick off-the-line acceleration, the XL-7 easily outstrips its competition. The engine also provides for up to 3,500 pounds of towing power. Models equipped with the six-speed automatic have not yet been tested, but critics say the old five speed operates smoothly and quickly moves into the right gear. Critics agree that the 2009 XL-7 does not handle particularly well. Although its Macpherson strut front and multilink rear suspension offer car-like driving dynamics, its long and narrow body makes the XL-7 prone to significant body lean around corners. Test drivers quickly learn to take curves at very slow speeds. The ride generally feels smooth and comfortable, thanks to a soft suspension that absorbs bumps well. However, the same softness translates to predictable float and vague steering that lacks and driver connectedness to the road. Big dips in the road produce noticeable swaying and wandering. The crossover also has a wide turning circle of nearly 42 feet, making maneuverability on tight city streets or in crowded parking lots somewhat unwieldy. Brakes feel strong and responsive. The self-leveling suspension, which adjusts the rear ride height in order to keep the front wheels properly balanced, does improve stability, and the AWD system performs capably, but tighter handling and more refined dynamics can be found in most of the XL-7's rivals. 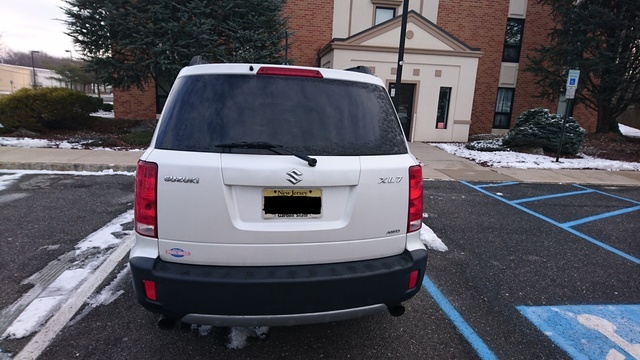 Rear visibility raises red flags for both critics and owners of the 2009 XL-7. Thick pillars, a small rear window, and the tapered roofline cause severe blind spots both to the side and out the back. Suzuki got rid of the five-seat XL-7s, so now all trims come with three rows that claim to fit seven adults, but really are better suited to four adults and two small children. The third row feels cramped and uncomfortable for adults, particularly on long trips, and the second-row bench's width best accommodates two, not three, passengers. The second row split-folds 60/40. It flips up and folds flat, while the third row split-folds flat 50/50. A fold-flat front passenger seat adds extra storage space for longer objects. Access to the third row is tight and awkward, and the high ride height of the '09 XL-7 makes entry and exit difficult for shorter people. Cargo capacity ranks comparable to the rest of the class. Unfortunately, the third row reduces cargo space, which measures a tiny 14 cubic feet with all three rows up, but this expands to a respectable 49 and 95.2 cubic feet as each row folds down. A roof rack is standard on all trims. The cargo bay features a convenient underfloor storage compartment. Critics say the liftgate does not raise up high enough for easy loading. Cabin storage consists of an overhead console, a center console with storage bins, and a rather small glovebox. With over 40 inches of headroom in both the first and second rows, drivers and passengers do not feel boxed in, and the tilt and slide sunroof (standard on Luxury and Limited trims) opens up the cabin even more. Drivers get tilt, but not a telescoping function for the steering wheel, and critics say that the controls are large and easy to read. The simple layout seems intuitive except for the location of the power windows and locks on the center console rather than the driver's door. Even in the base trim, second-row passengers get their own controls for heat and air-conditioning. The optional navigation system takes a while to learn, and its small screen makes reading difficult, but it does not absorb the music and climate controls. Seats are comfortable and supportive, and in all but the base trim, the driver's seat can be power-adjusted six ways. Leather upholstery gets added in the Luxury and Limited, but both critics and owners agree that the quality of the cabin materials feels somewhat cheap and bland. Taking over the position as the base trim, the Premium offers full power features (windows, locks, mirrors), remote entry, cruise control, a trip computer, second-row climate control, and a 6-speaker CD player. The Luxury aims to please with heated seats and mirrors, leather upholstery, a 6-way power driver's seat, wheel-mounted audio controls, a sunroof, and a 6-CD changer with MP3 jack. The top-of-the-line Limited upgrades to the touchscreen navigation system, a 7-speaker Pioneer sound system, and remote start, which starts the engine and sets the cabin temperature. Most of the higher-end features are available as options for the lower trims. The '09 XL-7 earns four and five stars in both frontal and side impact tests from the NHTSA, and a solid four stars in rollover tests. The crossover comes well-equipped across its lineup, with traction and stability control, four-wheel disc and ABS brakes, and electronic brakeforce distribution. Dual front airbags include passenger deactivation sensors, but side curtain airbags cover only the first row of seats. Front and rear crumple zones help minimize collision impact. Daytime running lights, automatic headlamps, and a tire monitor round out the safety profile. The high-end Limited trim offers an optional rearview camera, which addresses some of the serious rear visibility problems caused by the XL-7's small rear window and sloping roofline. Early word from owners of the 2009 XL-7 gives the most praise to the crossover's superior engine and transmission combination, which deliver impressive power and confident acceleration when needed. Drivers also like the high-quality design and style. Owner reviews of the virtually identical 2008 model echo these opinions and add further praise for the long list of standard features, comfortable interior, roomy cabin, and safe and secure ride. The fuel economy and rear visibility top the list of negatives, and many drivers dislike the road noise and difficult maneuverability of the XL-7. While some owners like the interior style, others find it bland and made of cheap plastics. Putting the power window controls on the dash instead of the door annoys a few drivers. CarGurus drivers have not commented on the latest XL-7, but the 2008 version earns high marks for its smooth, Lincoln-like ride, acceleration power, and comfortable seats. Despite its low mpg numbers, some drivers find them more than respectable for an SUV. The only major gripe focuses on the wagon's low ground clearance. What's your take on the 2009 Suzuki XL-7? Have you driven a 2009 Suzuki XL-7? P0008 & P0018 Code Help!!! How Do I Remove The Headrests And Front Seat Backs On A 2009 Suzuki XL 7? I have a 2009 and the seatbelts got eaten by mice. It is crazy expensive to replace whole seat belt assembly can I change the webbing!? How Do I Delete My Car Fot Sale?